​Thank you everyone that participated in the TrailMark Holiday Lights contest on our Facebook page! The winners are: 1st place: $100 to Rex Williams (41 likes), 2nd place: $50 to Leighton & Lauren Cartwright (21 likes), 3rd place: $25 to Rhonda Kay Herbel Linser (20 likes). Congratulations! Thanks to everyone for decorating the neighborhood and making it merry and bright. View the Entries and Winners Happy Holidays! 1) Post a picture on the HOA Facebook page of your outdoor holiday light display at night (or post a neighbor's house on their behalf!). We welcome a fun caption to "name" your masterpiece! 2) Deadline to post an image is the end of day on December 15th. 3) The houses with the most likes by end of day December 20th wins! First place prize is $100 gift card, second place is $50, and third place is $25. View the Entries - Happy Holidays! Thank you to all that came out in the snow to make the annual HOA and TMMD budget meetings on Thursday, November 17, and to help vote in our three HOA board members! We know it is challenging with the weather and with dinners to make. But we are so grateful for the support and interaction. To those that sent in your proxy votes - thank you for doing this! The meeting was almost postponed when we did the final count that evening and didn't receive enough proxy to reach quorum. We needed 80 votes, and we were only at 67. So thanks to the community members who helped collect from their neighbors on their own time, to those who helped at the meeting by last minute texting neighbors to try to make the count, and to those that answered those last minute texts and emails and quickly sent in their proxy! We couldn't do it without your participation! Introducing your HOA board for 2017: ​President: Sally Janssen is a retired Army officer with 23 years of service. After retiring, she joined the ranks of the National Park Service and then Denver Public Schools. She has volunteered on the TrailMark Design Review Committee (DRC) since 2014 and has served on the HOA Board since 2012. Sally enjoys skiing, stand-up paddle boarding, hiking, and traveling. ​Vice President: Michael Penny and his wife, Lisa, moved to Trailmark in July 2015. They love it here and have made the community their home. They have two children, Garret, a senior at UCCS, and Anna, a sophomore at Heritage High School. The family is completed by their three dogs. Michael looks forward to getting more involved in the community through the HOA. Secretary: Julie Devin and her husband, Ryan, moved to TrailMark in January 2013, and have two young children. She grew up in Littleton, Colorado, and is a proud graduate of CU (go Buffs!). She has a background in marketing, journalism and anthropology. She enjoys hiking, mountain biking, trail running, and snowboarding. Treasurer: Sandy Farish and her husband, Andy, have been TrailMark residents for 11 years. Sandy recently retired from Oracle Corporation, where she worked as a senior analyst, and now plans to spend the first year of retirement caring for her newborn granddaughter. She enjoys walking the local trails with her husband and dog, and the beautiful scenery TrailMark provides. Member at Large: Patrick McClammer moved to the Trailmark community in July 2014 with his wife, Katie, and two sons, Gavin and Ryan. He spends his free time skiing, mountain biking, hiking, and woodworking. He is the Director of Technology for IRBNet, a research compliance software company located in Cambridge, MA. His spirit animal is the Big Horn Sheep. The Jefferson County Public Engagement team is excited to announce plans for our new enewsletter, which will launch in early 2017! The enewsletter, titled Engage Jeffco, will be a great resource for citizens to stay updated on county news, important services, events and much more. The goal of the Engage Jeffco enewsletter is to not only inform citizens, but to get them engaged in their community. We would love to hear your feedback on topics that interest you. Please feel free to comment or send us a message with details on what you would like to know more about. To subscribe to the Engage Jeffco enewsletter, click here. It has come to the attention of the City of Littleton that residents are receiving a yellow notice card in the mail regarding property code violations. The backside of the postcard includes an advertisement offering to buy properties in the area. While designed to look like an official public notice, the cards were not produced or endorsed by the City of Littleton. For questions or to check on the validity of mail you have received from the city, call 303-795-3700. On Thursday, November 17, the 2017 budget was approved, and good news all - there will not be an HOA dues increase in 2017. Also, three open positions on the HOA board were filled. Please welcome new members Patrick McClammer and Michael Penny to the board, and welcome back Sally Janssen for another term. Thank you for volunteering to help our community! And to Frank Melara and Kim Longbrake, thank you for serving on the board and helping make TrailMark even better. We are grateful for your time and service! Three positions are open on the HOA Board of Directors. Any TrailMark resident interested in serving is encouraged to fill out the self-nomination application and submit it to the HOA Board at board@trailmarkhoa.org. Positions are irrelevant at this time as they will be decided after the election. QUORUM NEEDED! If you do not plan to attend, please fill out this proxy and email it to board@trailmarkhoa.org. (One per household.) PARKING FOR TONIGHT'S MEETING IS LIMITED. Parking is allowed in the marked spaces in the fire station parking lot, on the street, and in the small 4-space parking area across the street from the fire station. Please note that the meeting date has changed from 11/10. All are welcome. Agenda Please note that this date has changed from 11/10. On October 26, a resident and her dog were chased down the street by an off-leash dog, badly frightening our fellow neighbor. The City of Littleton's leash law states: "Both the City of Littleton and South Suburban Parks and Recreation require that, outside of designated off-leash parks, pets must be on a leash at all times." Please help ensure the safety of all residents of TrailMark and their pets by keeping your dog(s) on a leash at all times. Thank you! Clean out your medicine cabinet and dispose of your unused or expired medications. The National Prescription Drug Take-Back Day aims to provide a safe, convenient, and responsible means of disposing of prescription drugs, while also educating about the potential for abuse of medications. Items which cannot be accepted during Take-Back Day: Needles and sharps, Mercury (thermometers), Oxygen containers, Chemotherapy/radioactive substances, Pressurized canisters, Illicit drugs. For more information call 303-795-3881 weekdays, prior to the event. We have received a question on the HOA Facebook page regarding whether the HOA allows political signs, and we also received a notice that some signs are being removed from homeowner's yards. Please do not remove your neighbor's political signage, as this is their right as free speech, and it is considered trespassing. Here is what the HOA wrote regarding our notice about signage in the October newsletter: "TrailMark HOA covenants state that signs, with the exception of sales or lease signs, are not allowed in TrailMark, including political signs. However, Colorado state law limits an HOA's authority when it comes to political signs to the following: State law requires that political signs be posted on property for the time period of up to 45 days before the election date, and up to 7 days after the election date. If you plan on posting an election sign please observe the state law. Colorado Management will send violation letters to those homeowners who do not comply." ​There are three positions up for HOA Board Election. Any TrailMark resident interested in serving on the HOA Board of Directors is encouraged to fill out the self-nomination application and submit it to the HOA Board at board@trailmarkhoa.org. Positions are irrelevant at this time as they will be decided after the election. COME ONE, COME ALL!!! Please bring a 6 pack of your favorite fall beer for our beer sharing table as well as a dish to share (see below). Brats and Hot Dogs as well as non-alcoholic beverages will be provided. Bounce house for the kiddos and plenty of fun for all! This is the final Holland St. block party for the summer so be sure to join us! Please bring a dish according to your last name: A-I: Appetizer, J-Q: Dessert, R-Z: Side Dish. As usual South Holland Street will be closed for the festivities so please plan accordingly. ​As a reminder, HOA Assessments are due October 1st. If you have any questions, please contact Lori Williams at Colorado Management, 303-730-2200, ext. 3134. 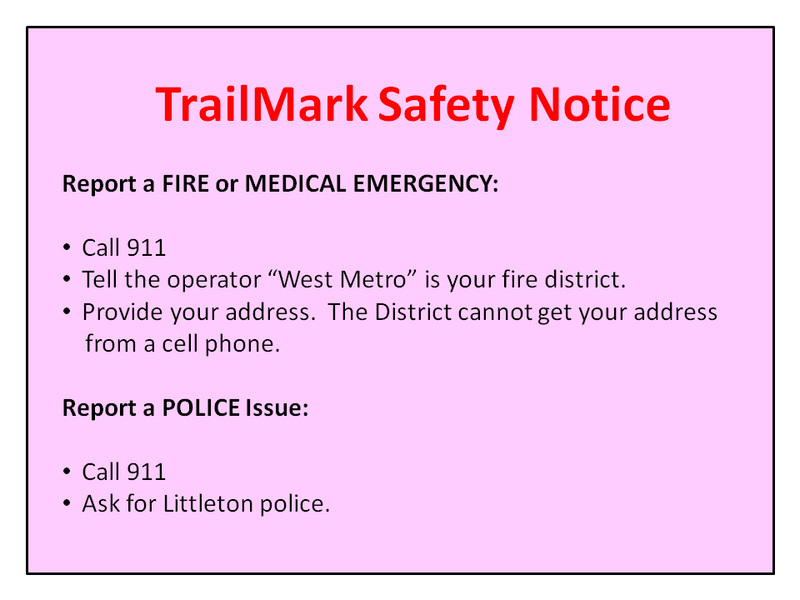 ​The TrailMark Metropolitan District understands that the TrailMark HOA has received inquiries about allowing canoes, kayaks, paddle boards, remote control water vehicles, etc. onto Fairview Reservoir #1. Click here to read the letter regarding this issue. Free hayrides, kettle corn, and face-painting! Cost: $5 per person, cash or check. Food vendors available for purchase. ​The TrailMark HOA is offering a new program called "TrailMark Neighbor of the Month" to honor all our kind and considerate neighbors who go above and beyond to keep TrailMark a wonderful place to live! Three neighbors have already been nominated for September: Robert Cannady, Juli Warton Hill, and Rick Redman! Up to four people may win each month, so there is still time to nominate someone! The rules are simple - nominate someone for a good deed or a job well done by posting their name and the action you wish to congratulate them for on the TrailMark HOA Facebook page (images welcome!). Winners will be chosen by the amount of likes to the post, so it is the community members that get to vote! Up to four winners will be selected every month, and each winner will be given a $25 gift card as a thank you for their contribution to our neighborhood. The same person may be nominated for separate actions, but may not be nominated for the same deed more than once a year. ​From the TMMD: On Monday, September 26, work will begin to remove sediment from the spillway on the east side of Fairview Reservoir 2. The excavated sediment will be spread along the pond banks, seeded and then covered with erosion blankets. This work requires the use of smaller sized excavation equipment which will be on site Monday. The work is not expected to take more than a day or two. ​Want to gain an in-depth understanding of how the City of Littleton and its major partners work together? How about meeting community leaders and future leaders? Interested in honing your leadership skills? Applications are now open for the 2017 Littleton Leadership Academy, a community supported non-profit project. To learn more and/or apply, go to http://littletonleadershipacademy.org. ​New this Summer! A variety of savory and sweet food trucks will be joining our community for purchase on the first and third Thursdays of the month, May through August, and September 15. Truck selections will vary. Please bring a picnic blanket or chairs, and your appetite! Thursday, September 8, 6:30pm at ​Fire Station 19, 8490 W Trailmark Pkwy. All are welcome. ​As we start a new school year, we would like to remind residents that when the school bus lights are flashing red, drivers have to stop from every direction. Colorado law states: "You must stop your vehicle at least 20 feet before reaching a school bus that is stopped with its red lights flashing whether it is on your side of the road, the opposite side of the road, or at an intersection you are approaching. You must remain stopped until the flashing red lights are no longer operating. Watch carefully for children near the school bus and children crossing the roadway before proceeding. You are not required to stop if the bus is traveling toward you on a roadway that is separated by a median or other physical barrier." 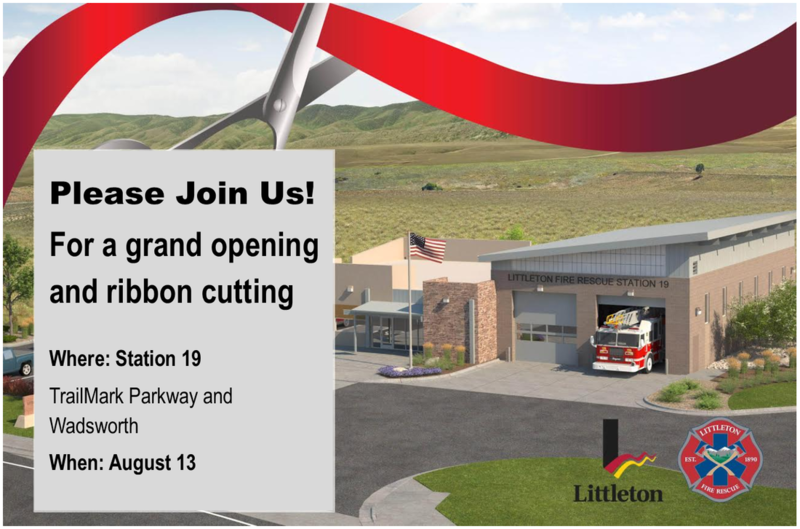 Saturday, August 13th - The City of Littleton Marketing and Communications staff has changed the agenda for Saturday's fire station grand opening: 10:00 am - Tours of the Station, Fire Truck shaped Bouncy House, Littleton Fire and Rescue Dive Team, Haz Mat Team, Ladder 12 Truck, Bike Medic Cart; 10:45 am - Dedication and Ribbon Cutting. Snacks and drinks will be provided. The no-parking signs along TrailMark will be covered, with some coned-off handicap parking spaces. Due to very limited parking please consider walking or biking to the event. ​Hildebrand Ranch is conducting its yearly weed harvesting this month, which could result in a greater presence of snakes in the community. Please be aware. ​The Aging Well Resource Center provides community resource and referral information for those over the age of 50 on a number of subjects including In-home care, caregiver support, senior living options, Medicare & Medicaid, insurance, transportation, food & nutrition, education, recreation, and volunteerism. They are the experts at finding the experts! If they don’t have the information you seek, they will find it! Staff members provide 30-minute consultations. Please stop by, call or email (No appointment is necessary). There is no charge for using the Center’s services. Grab Gab and Go: Stop in for complimentary coffee, tea and refreshments on the 4th Monday of each month from 1:30-2 p.m. Stay and learn about our services and/or continue on to the library’s monthly afternoon program which takes place from 2-3 p.m. Dress up your bikes, wagons and scooters for the Annual TrailMark July 4th Bike Parade! Monday, July 4th - Meet at TrailMark Park (kids' playground), Parade at 9:30 am. 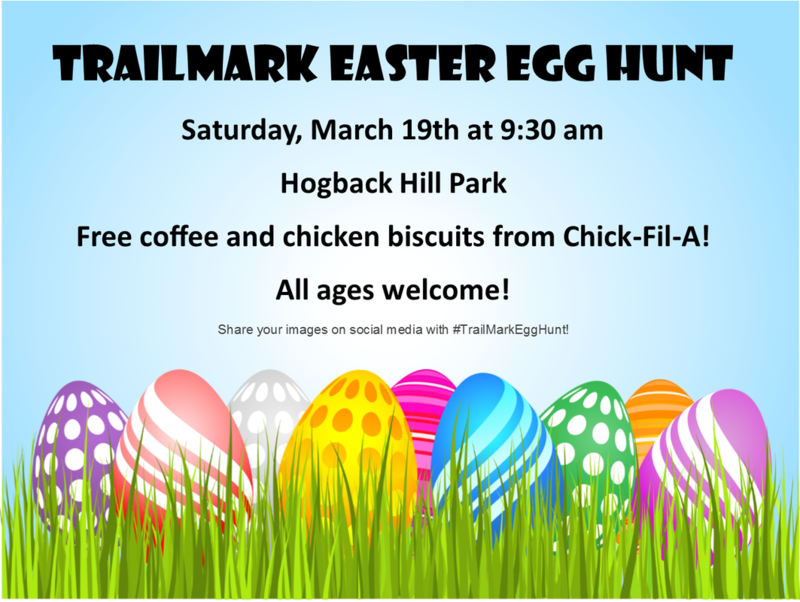 Be sure to stay afterward and enjoy the fun and games at Hogback Hill Park (athletic field), including Popsicles, face painting, balloon animals, a water balloon toss, and cookies! ​Volunteers Needed - Please contact Juli Hill at social@TrailMarkhoa.org. As a reminder, HOA Assessments are due July 1st. If you have any questions, please contact Melanie Martinez at Colorado Management, 303-730-2200, ext. 3134. As the Fourth of July approaches, it is important to understand the legal consequences regarding the possession and use of consumer fireworks in the City of Littleton. Each year the careless use of fireworks contributes to personal injuries and large financial losses to property owners, insurance companies, and the community. The use of fireworks could also result in criminal charges such as Arson and Criminal Mischief, as well as civil penalties for damages cause from the fireworks. The City of Littleton has adopted International Fire Code 3301.1.3, which prohibits the possession, manufacture, storage, sale, handling, and use of Class 1.4G fireworks. These “consumer” or “common” fireworks include bottle rockets, ground spinners/pinwheels/helicopters, flares, Roman candles, firecrackers (M80s, Cherry Bombs, etc. ), black snakes, and sparklers. Fines for fireworks violations top out at $2,650.00 or up to one year in jail. The Littleton Police Department would like to see everyone enjoy a safe and happy July 4th holiday, and recommends that you celebrate the holiday by watching one of the many outstanding professional fireworks shows around the metro area. To report fireworks violations or to file a complaint of fireworks usage in your area, call 303-794-1551. For all true emergency matters, call 9-1-1. I am writing to ask for your support. I have attached a letter of No Confidence to Littleton Mayor Bruce Beckman, council members Clark, Cole and Valdes for their ambush and firing of city manager Michael Penny on June 14th. As you are aware, I am on the city council but this letter is coming to you from Debbie, the citizen. Littleton has become a city that welcomes smart development, diverse housing, great business and young families looking for a place to raise their families. The current council majority seem to only support a regression back to the 1950’s. Firing the manager was not the first attack on our future by this council and the screaming Sunshine Group (obstructionists who are methodically destroying all our good work) and it will not be the last unless we stand up now and stop it. A bright future starts with a community waking up to what has been going on. If you agree with the letter please send an email to LittletonAwake@gmail.com with your name as you would like it to appear. And PLEASE reach out to your friends and neighbors. You do not have to be a citizen of Littleton to support this effort - just someone who cares about our future. Thursday, May 19, 6:30pm at the TrailMark Learning Center, 9743 S Carr Way - ﻿Agenda﻿ - All are welcome. Common Area Fence Painting Is Happening This Spring! If you have a common area fence on the south side of the neighborhood, painters may be coming by in the next few weeks to paint the exterior side! Gantner Painting has been hired by the TMMD to paint the common area fencing (on the exterior side only) throughout TrailMark. They paint in the neighborhood every spring, taking on 1/4 of the neighborhood fencing a year (so the entire neighborhood has been painted every four years). The owner, Greg Gantner, said that one person will jump onto the other side of your fence in order to shield and protect the homeowner's side from paint spray that could possibly damage the homeowners plants, decor, etc. The owner's name is Greg, and his number is 303-888-6974. Please call him with any questions. Help us keep TrailMark beautiful! The HOA will meet all volunteers at 8:00 am to pass out trash bags, gloves and waters in the Hogback Hill parking lot. Donuts and coffee will be provided! 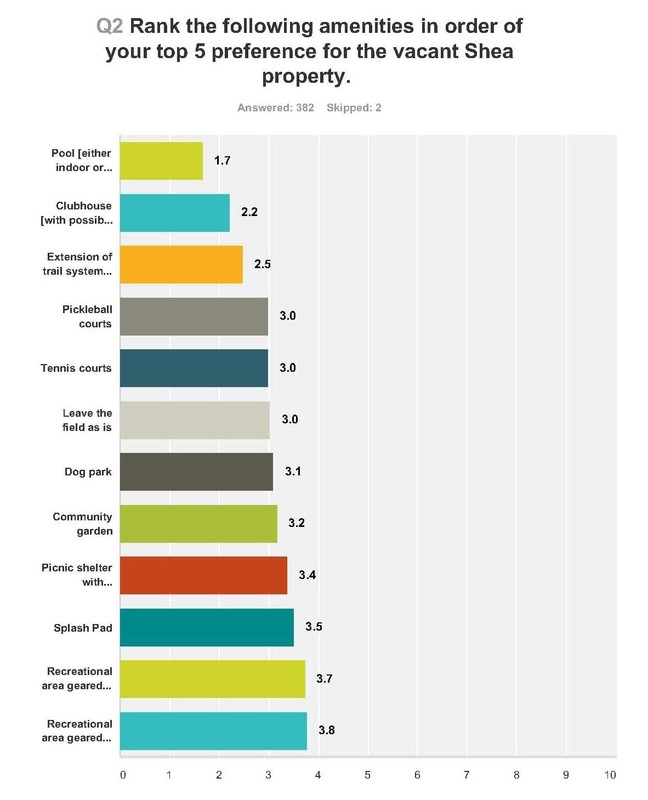 Results of "Proposed Amenities on Shea Property Survey"
Thank you to every neighbor that filled out the "Proposed Amenities on Shea Property" survey! 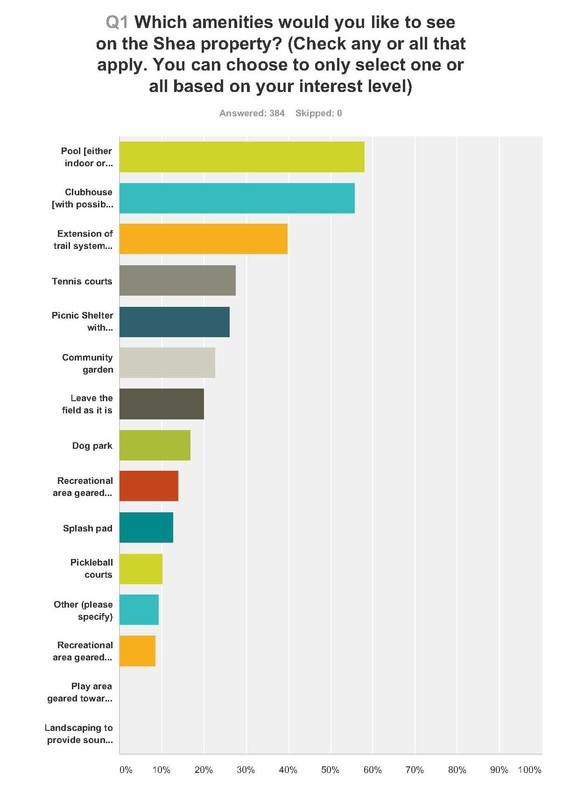 We received 384 unique household responses! The HOA board met on April 28th with City Council member Debbie Brinkman and City Manager Michael Penny to discuss the neighborhood survey consensus data. The City will continue holding conversations regarding the purchase of the Shea property, as it is not owned by the City at this point. 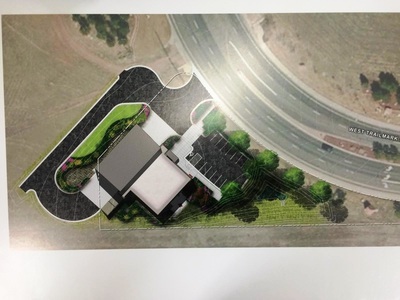 The City will also schedule a meeting with an architect to determine feasibility of the amenities and draw up a multitude of potential options and designs. There is no cost estimate at this time, as many details are unknown. The amenities and property costs have not been determined. The HOA Board will share any and all data on these issues as it becomes known. 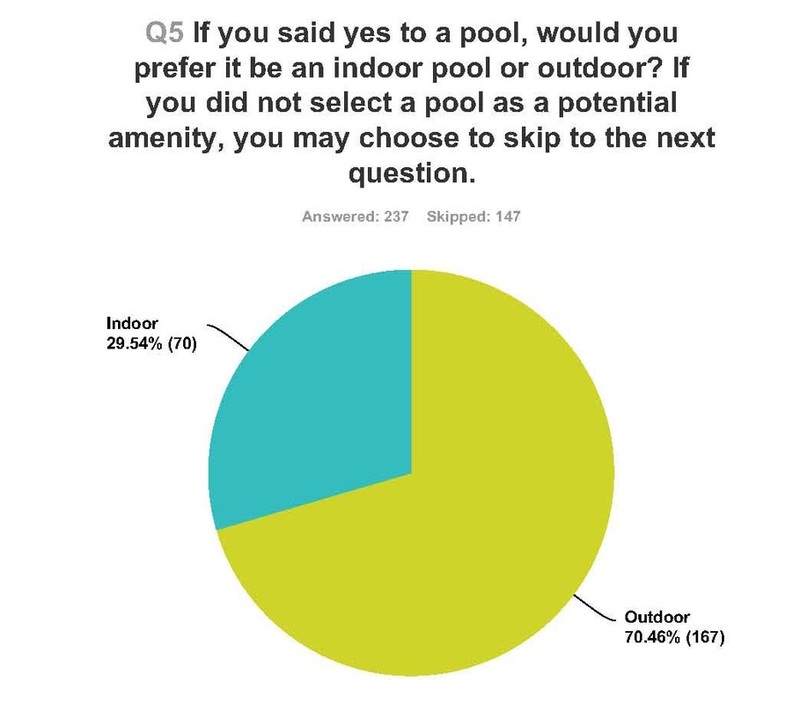 The results of the survey do not mean that those amenities will necessarily be in the final plan, nor that the top selections will be included and the lesser selected options will be ignored. 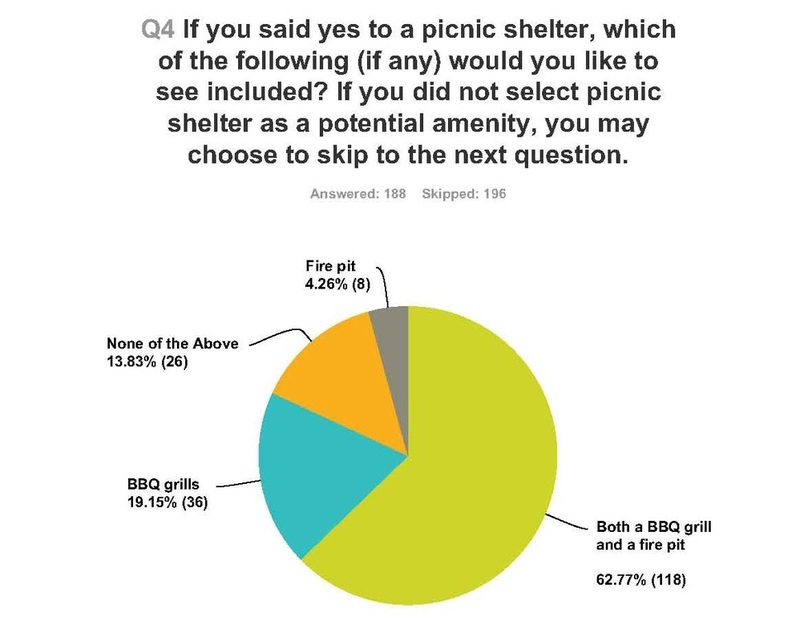 The survey was a starting point to see the desires of the community as a whole. The HOA board will send out monthly updates as they arise. Please stay tuned, and thank you for your patience as we go through the process that we hope will greatly add to the welfare of our community as a whole. Please send any questions or comments to board@trailmarkhoa.org. There is a new location for Food Truck Thursdays! Due to the permit and fee requirements for the food trucks to park on South Suburban land at the Hogback Hill parking lot, we moved the event to the vicinity of TrailMark Park. The trucks will park on the eastern side of S. Field Way facing the lake, near the bridge and playground. Food is available for purchase. Please bring your chairs or picnic blankets and join us for the first Food Truck Thursday event on May 5th! Due to HOA board member schedule conflicts, the May 12th HOA Board meeting is rescheduled to Thursday, May 19th, 2016. The meeting will be held at the TrailMark Learning Center at 6:30 pm. An agenda will be posted prior to the meeting. Two self nominations were received for the two open director positions. As a result, the two applicants will fill the open vacancies and the election originally scheduled for May 2016 has been canceled. Lori Tolle and Curt Fankhouser, the two applicants, will continue their service on the Board, both serving four year terms. Effective April 1, 2016, there will be one Director vacancy on the TMMD board. This vacancy results from Director Russell's announcement (and corresponding resignation) that he will no longer be a property owner/resident of TrailMark as of March 31st. The Board will be appointing a replacement Director to serve the remainder of Director Russell's term (ends May 2018). Anyone interested in filling the vacancy should submit interest to the TMMD District Manager Cathy Noon (CNoon@CRSofColorado.com) no later than April 29, 2016. Our thanks to Director Russell for his service on the board and best wishes to him and his family. While we love the geese that share our neighborhood and ponds, we would love to keep our wildlife and young children separated (for both safety and also hygiene concerns, aka the goose droppings everywhere). We are going to post a few coyote decoys around the playground perimeter starting in April. Please share this with your spouse and children so no one mistakes these decoys for the real thing. 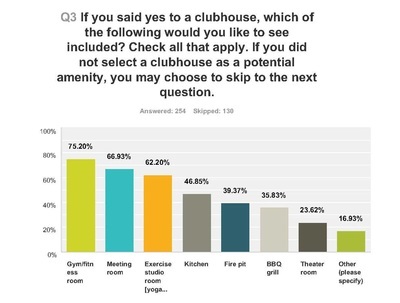 The survey for Shea Property feedback will come out in the April news email (on April 1st). Street work will be taking place in the TrailMark Subdivision. The main work will start on Monday, March 21, but there will be a couple of crews that will be saw-cutting starting today (3/17). Project Start 3/17/16, Project End 4/21/16. Work Hours 8:30 am to 7:00 pm Monday through Friday. Full depth crack repair, at multiple locations. Traffic Control and Flaggers may be encountered at anytime during work hours. Update from the City's Public Works Dept: The City will be using a contractor for full depth patching of the areas marked (with orange spray-paint). Due to budget constraints, not all the cracks can be done at this time. If a resident would like to request to get a crack filled, please contact the Public Works Street Department at 303-795-3981. You can also use the Littleton Click & Fix website. A TMMD member walked the Fire Station 19 construction site with the site superintendent and received the following update: The masonry proportion of the building and removal of scaffolding is scheduled to be completed next week. Utility lines, excluding gas and power, will be installed shortly thereafter. The superintendent has been in touch with our landscaper regarding irrigation and aeration lines, and trenching for these lines is scheduled to occur this month. Xcel is responsible for the gas and power installation, estimated to take place next month. 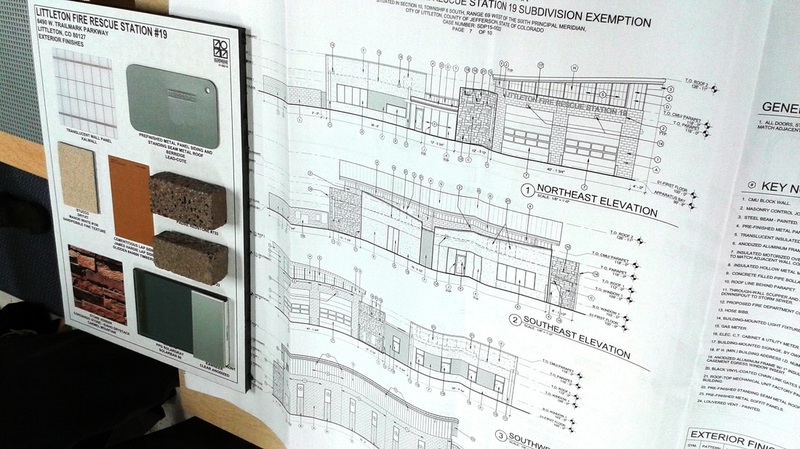 Paving of the entire exterior lot is also scheduled for April. March 10th HOA Meeting - Thank you to everyone who came out to share their feedback with the HOA Board on the potential purchase of the Shea property! Here is a quick summary of the ideas that were desired: a community garden; a pool; a clubhouse with some or all of these amenities - gym, meeting room, theater room, pool; a shelter with BBQ grills and/or a firepit; pickleball/tennis courts; a playground geared to older children (a rock wall, for example); and there were also requests to leave the land as is. All neighbors wish any of the amenities to have landscaping and be aesthetically pleasing. These ideas have created a wishlist, and the HOA Board will next send out a survey to the entire neighborhood to hone in on the true interest of the community at large. PLEASE get your email into our database so we can send you the survey link by going to trailmark.org and clicking the sign-up button in the upper right section. 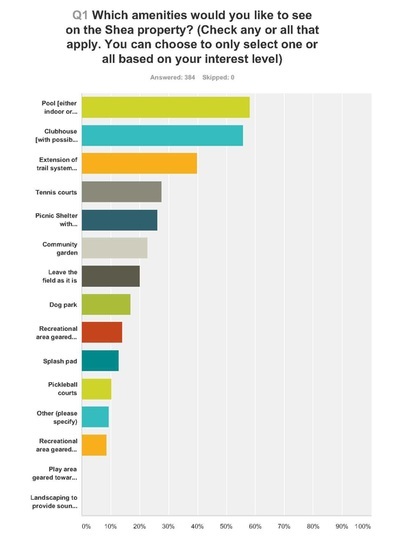 If you have more ideas to include on the list, email board@trailmarkhoa.org. Shea Property Discussion! At the invitation of Littleton City Councilwoman Debbie Brinkman and Littleton City Manager Michael Penny, the TrailMark HOA Board met to discuss the potential land use of the vacant Shea property located on the north side of TrailMark Parkway at the TrailMark main entrance. The City is in negotiations with Shea and has determined that the property is available to the City provided it is for non-commercial use and agreement can be met for the purchase price and amenities to be installed. 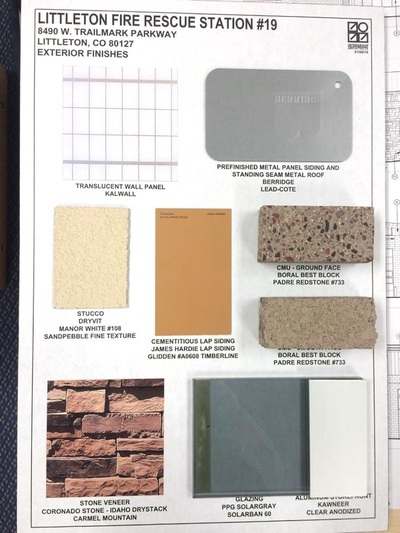 Councilwoman Brinkman and City Manager Penny are developing a “straw man” of potential amenities that might be incorporated into the space. 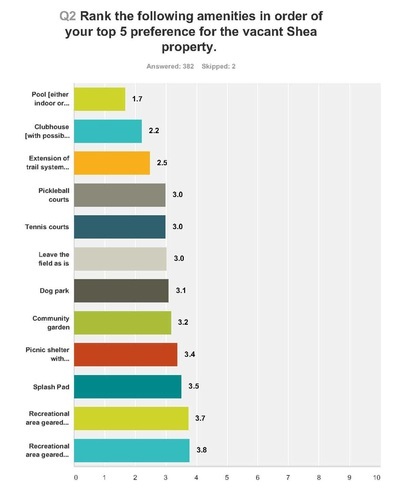 Once amenities are identified, a designer will be hired to develop a potential community park. Amenities discussed are: Bike/Skate Park, Community/Family Garden, Dog Park, Pickleball Court, Playground, Recreation Center with -Gym -Meeting Rooms -Swimming Pool -?????? 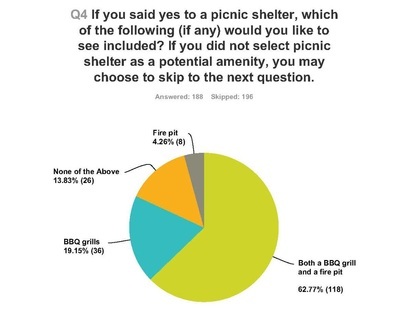 ?, Shelter with BBQ Grills, Landscaping to provide sound and sight barriers. TrailMark residents now have an opportunity to participate in the plan development for the site. Potential amenities will be an agenda item for the March 10th community meeting. Please attend and participate in the discussion Thursday, March 10th, 6:30 pm at the TrailMark Learning Center. Bring your ideas!! Meeting Agenda - All are welcome. March 9, 2016 - Mark Barons with the City of Littleton posted on Nextdoor.com: "...There has been some vandalism to the equipment working on the new TrailMark fire station. This has been occurring on the weekends and after hours. Please keep an eye out for this type of activity and report it to the Littleton Police immediately." As of March, 2016, this information is no longer current. I would like to have a meeting to get new ideas, comments on existing ideas, and an over general discussion about the events we have in our neighborhood. Let me know if you can come by sending an email to social@TrailMarkhoa.org. Or if you want to be a part of this, but can't come this night, let me know that, too. Intersection of S Holland and Finland:The city has completed data collection of the volume and speeds in the area and has done an assessment of the location, and will be meeting with HOA representatives in March to discuss options for speed control at that intersection. Tuesday, February 2 - It is a Snow Day for most, but Alpine Waste & Recycling WILL be picking up in TrailMark today. The Street Maintenance Division will be in the neighborhood Tuesday, January 26th to remove ice. The original date of January 22nd was delayed due to the snow forecast over the weekend. It will take several days to complete the job. The new sewer rate is $55.91 for residential customers, which is billed bi-monthly (every two months). Ken Caryl Ranch Water & Sanitation District provides sanitary sewer service to the TrailMark subdivision. 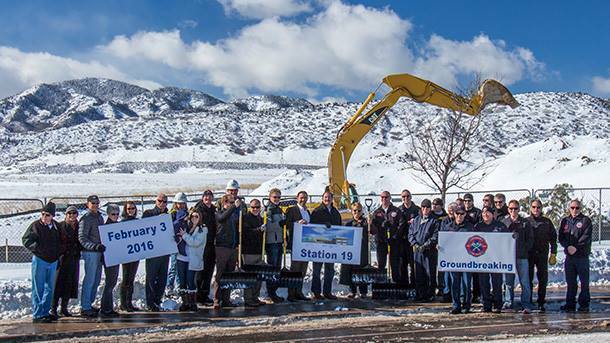 Denver Water is the water provider and the City of Littleton processes the storm sewer. Posted January 18, 2016. Representatives from the City of Littleton presented the improved plans for the new fire station at the January 14th HOA meeting. Thursday, January 14, 2016, 6:30pm at the TrailMark Learning Center, 9743 S Carr Way. Meeting Agenda. All are welcome. 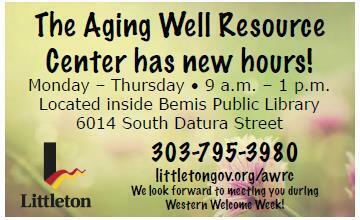 The Aging Well Resource Center provides community resource and referral information for those over the age of 50 on a number of subjects including In-home care, caregiver support, senior living options, Medicare & Medicaid, insurance, transportation, food & nutrition, education, recreation, and volunteerism. They are the experts at finding the experts! If they don’t have the information you seek, they will find it! Staff members provide 30-minute consultations. Please stop by, call or email (No appointment is necessary). There is no charge for using the Center’s services.